This is the discussion related to the wiki page	Testing Web Services with soapUI. Just wanted to say "Thanks" for posting this. I was looking for a good way to test a Web Service before just dumping on the third-party for testing and the only thing I could find was Oracle's JDeveloper. Then I found this. It was quick and easy to get setup and running. I am still having trouble figuring out the security, where I want the connection to go through as a specific user, not the "default" App Server user or XMLLINK user. as u stated u have successully using Get/Add/Update method. Can u help me out for this problem. By the way you can also do this in the request properties in soapUI. Select the request then look at the bottom left - there should be a bunch of request properties available including Username and Password. Praj, I tried using an invalid UserName and Password using the Request Properties and it has no affect on the Request results. My real question is how you get the UserName and Password elements to appear in the header of the SOAP envelope. These elements appear when you generate the SOAP from PeopleSoft, but they do not appear when 3rd party apps such as SoapUI generate the SOAPs from the WSDL URL. One thing I've noticed is that the web service authentication information is not shown in the XML view for the request. Try switching to the Raw view and check if it appears there? These are the two tabs on the left hand side. Thanks for this guide. I tried doing that but credentials are missing even in RAW tab. I have tested this in SendMaster utility and their I could see credentials tab and it was working fine. That looks very promising. Thanks for post. Thank you for posting this. Someday I will return the favor to you. Does any body know what would be best way to delete data through Web Service? We used to do it Collection.deleteItem(i) for CI but with CI-Based Web Service am unable to find a delivered way to do it? Will I have to write and expose custom method? Any suggestion would be appreciated. Can you use the Update or UpdateData methods to remove the keys and therefore delete an entry through a SOAP request? 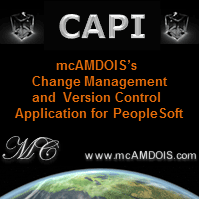 I used the instructions provided in the article "Component Interface based Web Services" (http://www.peoplesoftwiki.com/component-interface-based-web-services) and was able to successfully provide a web service and view the WSDL for interfacing with the PeopleSoft delivered Message Catalog component. I was also able to create a new project in soapUI after using the URL to the WSDL provided by PeopleSoft. However when I double-click on the generated request for the get method the SOAP envelope, that looks like the one below, is missing the MESSAGE_SET_NBR tags where I can enter test data. But I am still interested in finding out why the tag did not get self-created when I imported the WSDL. It would be helpful especially when I have a CI that has a lot of data elements. Any help or comments are appreciated. I believe the numbers that appear for each request relate to the input messages for that method. For example, in the Get method above, the input message might be M149999.V1. That is, it takes the first 3 characters of the message name. Now if you have a look at your your WSDL through the Interface Viewer - right click on your service, Show Interface Viewer you can go to the WDL content and look at the relevant items - see screenshot below. This might help to explain it, or at least give you some clues? Any Idea why I am getting this error? Sounds like a general integration broker error - can you confirm integration broker is running on your system? and the only way to get things working again is to roll the server processes on the integration gateway machine. Any ideas how to resolve this?